When you first set out on the road to getting your first website designed and built your web designer may give you a number of options, in terms of ways in which they can go about building your website. One of the questions they will ask is do you want a static or a dynamic website, although generally this will be presented as the question do you want a Content Management System or CMS which is dynamic website framework/system. In this article we are going to briefly introduce these two concepts so that hopefully you can make a more informed judgement when making a decision about what type of website that you wish you web design company to build for you. We at iDigLocal offer both web design services and there are some advantages and disadvantages to both forms. Before we get started on describing the details of the different forms of website design we just want to get to grips with how a web page ends up on your computer. Basically, when you went to this page via your web browser you web browser sent a request to the web server that stores this web page in its file system and the server then sent that requested file back. A server, is called a server as it serves up files/data to other client computers upon a request. 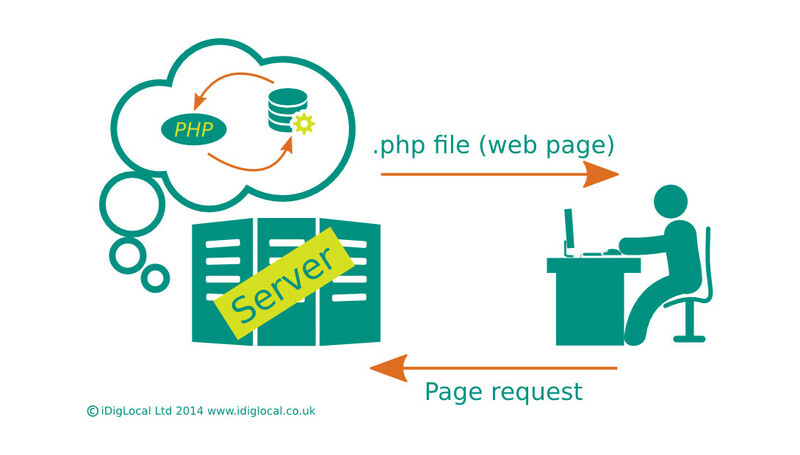 A web server or http server responds to two request really, GET requests and a POST requests. Typically browsers send GET requests which do as the name suggests, ask the server to get a file. Post requests allow your browser to send information to the server. Post requests are used, for example, when you fill out a form on a web page, or in dynamic websites for altering the information sent back based on what you have sent in your POST request. So, in the end, web pages are just coded text files on another computer. The way the code is displayed to you is the way that the html (hyper-text mark-up language) is interpreted by your browser, that’s what browser do. Your browser sends GET and POST requests and then displays the content on the basis of the html code sent back. All html is is content enclosed by tags that add context for instance <p></p> designates the enclosed text as a paragraph and your browser knows that when text is enclosed by <p></p> that it should be displayed as a paragraph. There are lots of different html tags for different things. A static website is one that is said to be Hard Coded, that is to say all the content is written directly into the code. The file will have a .html suffix. The content that is served up upon a GET page request will always be the same, it will never change unless you edit the content in a text editor. This would usually require downloading the file from the web server where it resides using FTP (File Transfer Protocol) then editing the content in a text editor, saving it and then uploading the file back to where it was on the web server, again using FTP. This is not as complicated as it sounds, html is not rocket science and the different tags are easy to learn. For instance in the image to the left we have the <div>, <h1> and <p> tags which mean Division, Title size 1 and paragraph, respectively. If I wanted to change the title for the page I would find the title tag and change the content. The main issue with a static website, is not so much changing the content of an existing page its the added burden of adding new pages. A new page has to be written in html code, and more than that, all the links have to be incorporated in menus. Basically there are lots little things that need to be done to update all the pages of the website. For example, the menu appears at the top of all pages, if you add a new page to the web site and you want the link in the menu then you will have to edit each page’s code in the area that sets out the menu to add this new link. It can become very time consuming and prone to errors as it is difficult to keep track of where all the changes need to be made. So with this in mind you do not want a static website to be very complicated. At iDigLocal we tend to use techniques for our static websites that structure the content in such away so that these changes are easier to make, i.e. reducing the number of places that changes would have to be made if new content is added. We would also give you some tuition as to how you can change the content yourself. The advantage of a static website is that search engines still seem to prefer static content, dynamic content can lead to confusion when they index the site and that’s not good for Search Engine Optimisation (SEO). Also a static website, once built is very robust, there is not a lot that can go wrong and finally a static website can be much faster than a dynamic website as no pre-processing is required and pages can be easily cached. So if there is no need for lots of pages and you don’t expect to be updating your content very often a static website is generally the best solution, it can also be the cheapest option as long as its not large. A dynamic website, as the name suggests means that the content served up by a particular web page / file can change. Generally speaking dynamic websites are written in a coding language called PHP, an acronym for Hypertext Preprocessor, and usually involve the content to be stored in a database, commonly a MySQL database. So rather than a simply GET request where the server receives a request and simply returns the file, as the acronym suggests, there is a GET requests, the server then processes or executes some code in a .php file that is requested, this then determines what html code is sent back to the browser. A dynamic website does not have to consist of lots of different files, it usually consists of a few template files, one template file will be used to serve up many different pages, the content changing with context, for example the information provided by the browser to the server in a POST request. Now what is the advantage of this you may ask, well the short of it is that you can be more creative with what the website does. A CMS is a dynamic website, WordPress, for instance, uses PHP and a MySQL database to manage the content and its presentation to the end user. You can write a simple dynamic website, enter the content into the database yourself, when you want to update the content you would then have to access the database to change it. A CMS makes this type of data management easier by providing a user friendly graphical user interface (GUI) so that the content to the website can be changed easily. More than just allowing you to manage what content is served up it also means that you can add extra functionality, for example you can determine if the request is coming from an iPhone and serve up different content to the user based on this fact. There are lots of different things that can be done with a dynamic website that is limited only by the imagination and coding ability of your web designer. We at iDigLocal tend to use a CMS when we create a dynamic website. The reason is that it becomes very easy to create new content and manage the content. We can also right plugins, for example wordpress plugins, that will add bespoke functionality for a particular clients needs. e.g. recently we wrote a wordpress plugin for an e-commerce site that will create an .xml file that can be used as product feed for the clients Google Merchant account. that way they do not have to manually add products are edit a file when they add new products, it is done automatically. Alternatively we can create what are call Widgets, which are essentially forms in the admin area of a WordPress site, that make the adding of new content very easy, that information submitted in the widget is then output in a specific way and a specific place the site owner merely has to fill out the fields. So the great advantage of having your web designers build you a dynamic site is that you website will be able to do more things, have increased functionality, and it will be easier to add new content and manage existing content. Although initially the price can seem more expensive, if you are thinking about having a website of more than a few pages, and/or you want to be able to easily add new content, then in the long run it will be much cheaper. SEO can be more problematic (you have to check that you are using whats called pretty permalinks and that your title and description meta tags are not all the same, but simply by virtue of the increased amount of content you website is likely to have this will offset any problems that you may encounter. Also the advantages of a static website, in terms of SEO are not that large. What ever the choice we at iDigLocal can help. The other thing to remember is that unlike a lot of web design companies we will never hold you to ransom. 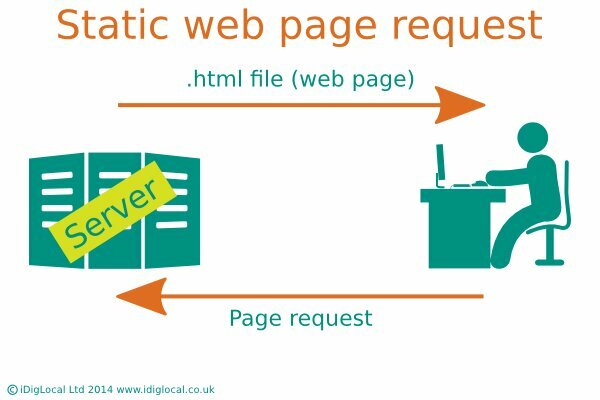 Once you have paid your final instalment on your website development we will upload it to the web server of your choice, whether you use iDigLocal’s web hosting or not. Then you can do what you want with your website, its a product we sell and you would have bought and paid for it. you can manage it yourself or you can take advantage of our web site maintenance services or not. I hope this guide was of some help to you, if you have any questions about our website design services please don’t hesitate to contact iDigLocal.